In light of this, it's phenomenally unsurprising that The Broken String feels like a poorly assembled singles collection, a tired career retrospective (featuring 3 new songs! ), an almost-hits. Or perhaps the problem is that I've been expecting too much from this band for too long; I know that they have talent and can (and do) write great pop songs. Or maybe it's unfair of me to judge this record in the context of the EPs, especially since they were self-released and many people probably still haven't heard them. 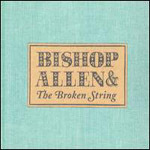 Maybe, just maybe, if this is the first time you ever listen to Bishop Allen, this record is the one. I've thought long about that, and it just seems unlikely. It seems unlikely because, at the end of the day, the best thing about The Broken String is the best thing about Charm School (2003), and is one of the best things about Christian Rudder and Justin Rice: they're all really likable. The Broken String is a collection of mostly likeable songs, one dud, and one song-of-the-year-quality track. That track is "Flight 180," the best song Bishop Allen has ever recorded, and perhaps the best example of how having a year to do whatever you want can push your sound in new directions (hear the song right now over at the August podcast). From the Christmas tree imagery at the song's beginning, something isn't quite right: the narrator is drifting in and out of sleep, the plane is preparing to land, the music is low and eerie. It moves, eventually, and powerfully, to its noisy conclusion, marred only by overdramatic whispering that did not appear on the April EP. The song's key repeated line--"If you feel like dancing / Dance with me"--is effectively haunting as it moves from an honest flight attendant fantasy to a desperate wail. "Flight 180" is followed by "Like Castanets," which is the sonic equivalent of having someone turn on the lights while you're sleeping. The sequencing throughout the album, but especially here, is puzzling. "Castanets" is an old-school Bishop Allen insta-classic; it was one of last year's first free downloads (they usually did one per month), and they play it in the live show. In other words, it could have been anywhere and sounded better than it does here. Another thing the sequencing slyly suggests is how good the three new songs on the record are. "Rain" is solid, and even stands out in the second slot, following the Picaresque-esque (2005) "Monitor" and before the "Click Click" song. The other two new tracks, "Middle Management" and "Choose Again," solidify a back half that threatens to slip away after "Shrinking Violet" (the dud) and a version of "Corazon" as polished as a new locket. Production values throughout the record are very high, which for me only makes the EPs that much more awesome. Perhaps, beside all of my qualms, my personal hang-ups, and my real love for these guys (I didn't even mention their touring band, whose current lineup is the best they've ever assembled), Bishop Allen is the most subversive band playing right now. They're road warriors, they're DIY, they're nice as hell, they don't trust "the industry," they give away their songs for free, they love their fans, and they just can't release their Breakthrough Album. Maybe they don't even want to. The problem is, it's tough to be cult superstars and make pop music meant to be heard, and that means they've also subverted peoples' expectations. At least mine.